In a previous post, we discussed the latest studies pointing to the detrimental effects of stress that is caused by a lack of balance and provided several tips that can help you get to a better place. By taking advantage of employer benefits like family leave and seeking flexible career opportunities, it is possible to have a successful career AND have time to pursue your personal and family goals. So which jobs offer the most flexibility? Glassdoor.com has put together a list of the best jobs that allow the most flexibility for work-life balance. The ratings are on a 5 point scale with 1.0=very dissatisfied, 3.0=OK and 5.0=very satisfied. Do you need help finding a job with great work-life balance? 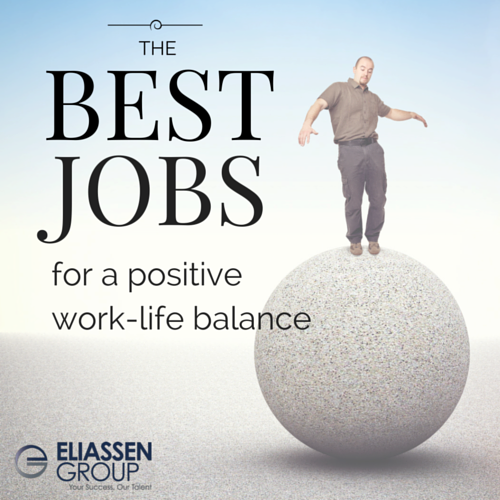 Give Eliassen Group a call at 800.354.2773 or email us at careers@eliassen.com. Explore our Job Board to find your next career!